Banking, licensing, security: Statewide, the hurdles to opening an Alaska marijuana business run the gamut. And in Anchorage, there's one more barrier for those wanting to be cannabis business owners – parking and landscaping requirements. On Tuesday, Arctic Herbery owner Bryant Thorp was given the go-ahead by the Anchorage Assembly to open his retail marijuana shop – which will likely be the first in Alaska's largest city. But before the Assembly would greenlight Thorp's business, he first had to upgrade his shop, situated in an old house on Arctic Boulevard. "The building itself had to be brought up to standards," Thorp said. So Thorp dug up and paved the parking lot. He overhauled the sidewalk. He added streetlights, and the "3 trees and 18 shrubs" required in Anchorage's code, he said. But then, Thorp had to resolve a concern he didn't have enough parking for a "Krispy Kreme-type opening," if customers swarm to the shop in the early days, when he may be the only pot retailer open in the Anchorage Bowl, he said. So he agreed to temporarily open another part of the lot for overflow parking for those first days. Thorp estimates it added up to about $35,000. That was with a "sweetheart deal" from a friend who runs a construction company, he said. Thorp isn't alone. The landscaping and parking requirements have affected many other Anchorage marijuana businesses trying to open their doors. "It's a huge issue," said Jana Weltzin, an Anchorage cannabis attorney. "Every single client, in some form or fashion, had to do something" with regard to parking or landscaping, Weltzin said. The rules are included in Title 21 of Anchorage's municipal code. In 2016, rules that initially developed in 2002 and debated for a decade have become mandatory. Those include changes to parking and landscaping requirements. The issues, so far, haven't stopped any of Weltzin's clients in their tracks. "So far, knock on wood, we've successfully vetted all the properties and done the due diligence," Weltzin said. But the new rules aren't the only thing causing a headache for marijuana businesses, said Terry Schoenthal, manager of Anchorage's Planning Department. First, there's the fact U.S. law heavily discourages banks from working with marijuana businesses, so without any bank loans, owners look for cheaper properties they can afford. "These are not the most desired properties in town," Schoenthal said. For Thorp, one reason he chose the building is because the owner agreed to finance it, bypassing the need for bank involvement. Second, there's the required 500-foot buffer from schools and certain other properties that effect where a marijuana business can set up. 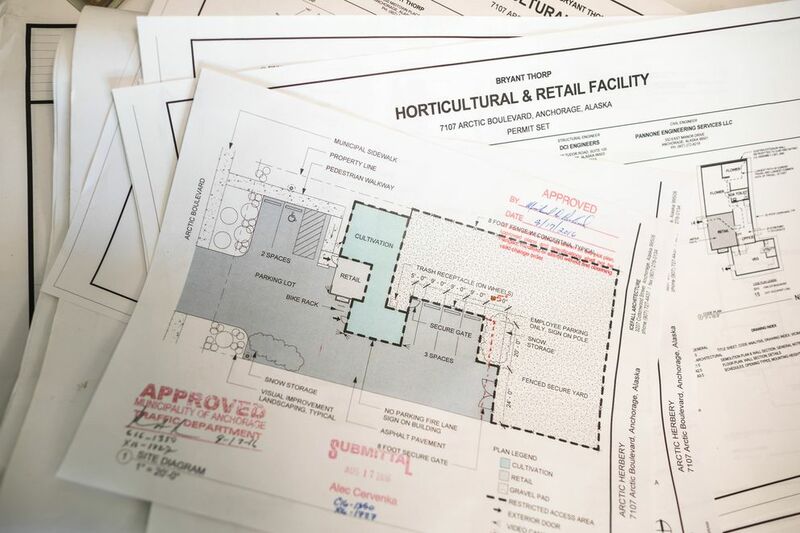 "They're landing a lot in industrial properties, and the result of that is they've been around for a long time and they never had any landscaping in them," as required under current rules, Schoenthal said. "But when you add 8 feet of landscaping in them, they might not have any parking." Many properties can apply for what's called a "non-conforming determination." Basically, if the building was constructed before Anchorage's Title 21 regulations came into effect in the early 1980s, it is grandfathered in and doesn't need to upgrade. That was the case for Kim Kole, owner of Raspberry Roots. Kole said they were able to squeeze in required parking spaces at the Midtown property without triggering landscaping requirements Kole said she wouldn't have been able to accommodate. "Yay for nonconforming, otherwise I'd be dead in the water," Kole said. But for businesses altering the nature of how the property is used, that's where bigger changes come in, Schoenthal said. Switching a warehouse over to a retail store, for instance, changes the amount of required parking. And while the existing spots may be grandfathered in, any new parking areas would need updated requirements – including the 8 feet of landscaping between the road and the parking lot. Such requirements exist for every industry, both Weltzin and Schoenthal point out. But Weltzin said stringent oversight has led to more scrutiny for marijuana businesses. "Nobody's watching other industries as much as ours," Weltzin said. "There's probably some truth in some cases to that," Schoenthal agreed. For Mark Malagodi, chief executive of testing facility CannTest LLC, the landscaping requirements have caused a delay in opening. Most of the building is grandfathered in, but not the west side of the Ship Creek property, which needs the 8-foot updates, he said. "It's doable. It's not something the landlord is happy about. It's a very frustrating thing because this building has been here for 20 years," Malagodi said. Many tenants used the building before CannTest, but the special land-use permit triggered the city's interest, he said. For husband and wife Chris and Rick Euscher's marijuana grow R.C. Tinderbox on King Street in South Anchorage, the parking situation has taken months to resolve, Chris said. Twenty-one parking spaces were required based on the size of the building, but there was only room for 14, Chris said. So they signed an agreement limiting the number of employees that can be on site at once. That works for the Euschers, who say their business won't be affected by the employee limit. Still, those required spaces should have been in place with previous tenants, Chris said. "I don't know how they got away with it," she said. Schoenthal said he sympathizes with the marijuana businesses. There are a lot of hoops to jump through. Some people don't have a development background, and aren't expecting these requirements, he said. "Imagine for a moment you're cashing out all of your life-savings to start this business up, and you didn't see any of this coming," Schoenthal said. The city is also on a learning curve with handling these applications, Schoenthal said. "It is totally a balancing act. You know on the one hand I think we want to encourage this new industry … But on the other hand, people, in spite of voting in favor of this, wanted protections in place," he said. 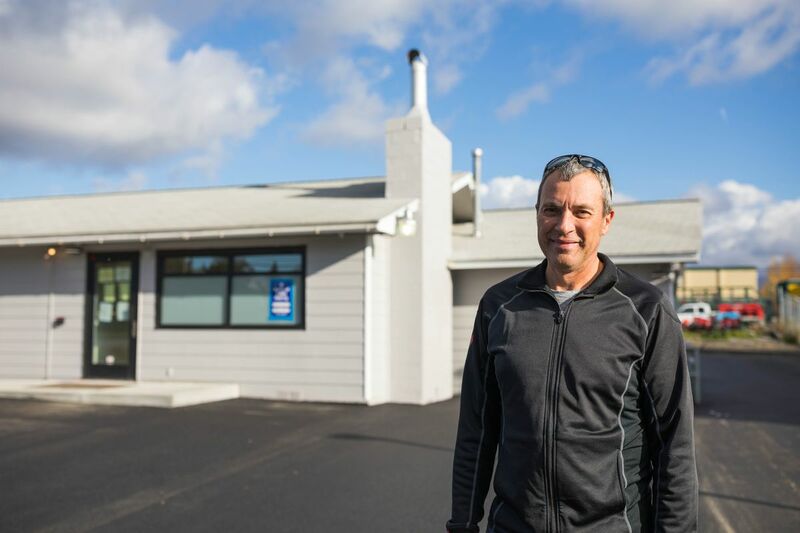 Thorp, an Anchorage real estate agent, knew there would be a long list of requirements for his business. Still, "the extent of what I actually had done — I wasn't prepared for that," Thorp said. "But that's OK. If you take a look at my building, it's beautiful."